“The Family Portrait” is one of the most beautiful portraits to have. Capturing a time that you can look back at and smile about is what life is all about. Their little boy was very active running and playing all the time. It was adorable and hard to sketch or keep him still with his parents. Obviously we worked that out by giving him that baseball glove that he loved Dad was able to hold him for “The Family Portrait”. I had to do a separate session with the parents since the most important detail was to have their son looking as cute as is truly was. I came back later to add the jewelry, the Mother’s earrings, ring, bracelet and the Fathers necklace and watch. 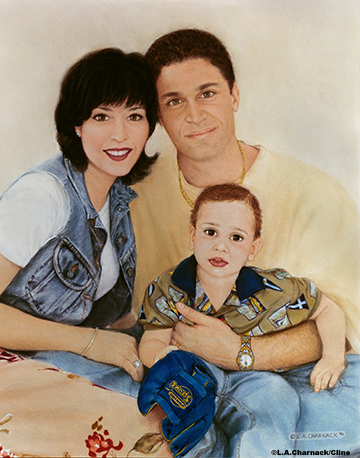 “The Family Portrait” pastel painting gave these details plus the sense of softness to the Mothers skirt and the texture of her jean jacket as her leaned into her husband and son. This family wanted a casual portrait with their son and Dad wearing jeans. Their shirt pattern fit in perfectly against the fathers soft yellow t-shirt. “The Family Portrait” encompasses the love between this young family.